I wrote a list of goals back in January... and I may have forgotten about them. And by "may have forgotten" I mean I did forget. Whoops. The good news is I still have time to do them before the end of the year. Well, except for the "lose weight and be healthy" thing. I mean, I still could do that too, but I'm lazy and I like unhealthy food. 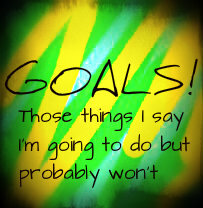 I try to create good goals for myself but occasionally (OK, usually) I have a hard time with my follow through. I'm a procrastinator... it's in my nature. Obviously I don't have to let it be that way, but... change is hard and stuff.